CHICAGO, Illinois, February 19, 2015 (ENS) – President Barack Obama designated three new national monuments Thursday, including Browns Canyon in Colorado, a popular fly-fishing, rafting and hiking area, inhabited by bighorn sheep, peregrine falcons, and golden eagles. The other two monuments are a World War II internment camp for Japanese-Americans in Hawaii “so we don’t repeat the mistakes of the past,” said Obama, and the Pullman National Historic Landmark District in Chicago, Illinois, where some of America’s most signficant labor and civil rights actions took place in the late 19th and early 20th centuries among the employees of the Pullman railway car company. 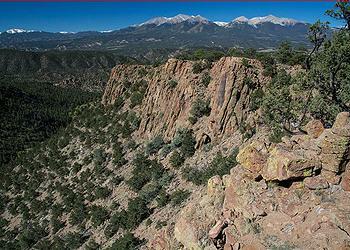 But for environmental protection, the Browns Canyon National Monument is the story here. “Browns Canyon harbors a wealth of scientifically significant geological, ecological, riparian, cultural, and historic resources, and is an important area for studies of paleoecology, mineralogy, archaeology, and climate change,” Obama proclaimed. Humans have inhabited the canyons, rivers, and backcountry forests for over 10,000 years, a statement based on artifacts dating back more than 10,000 years found in the Browns Canyon area, although most resources have yet to be surveyed or recorded. Of those that have been surveyed, there are 18 archaeological sites were identified, including five prehistoric sites eligible for the National Register of Historic Places, Obama said in his proclamation. Primarily seasonal camps, these sites include open campsites, culturally modified trees, wickiups, tipi rings, chipped stone manufacture and processing sites, a possible ceramic pottery kiln, and rock shelter sites that date from early Archaic Period and possibly Paleo-Indian Period – around 8,000 to 13,000 years before present. These dates make these among the earliest known sites in the region. Glaciers once covered the area’s rugged canyons, gulches, and mountains. The movement of these glaciers created unique topographical features in the river valley not found along other major streams in the region. The glaciers also filled the valley with masses of sediment, including the gold, silver, and semi-precious gems that fueled the mining booms of the 1800s. These gems continue to interest professional and amateur geologists. The forest is semi-arid pinyon-juniper and mountain mahogany woodlands on the lower slopes giving way to ponderosa pine, Rocky Mountain bristlecone pine, and Douglas fir at higher elevations. Scattered pockets of aspen, willow, Rocky Mountain juniper, river birch, and narrowleaf cottonwood is found along the along the Arkansas River and tributary streams. “A stunning array of wildflowers such as the scarlet gilia and larkspur bloom here during the spring and summer. Near Ruby Mountain, imperiled plant species such as Fendler’s Townsend-daisy, Fendler’s false cloak-fern, livemore fiddleleaf, and the endemic Front-Range alumroot can be found,” wrote Obama in his proclamation. Mountain lions, bighorn sheep, mule deer, bobcat, red and gray fox, American black bear, coyote, American pine marten, kangaroo rat, elk, and several species of tree and ground squirrels are found in the Browns Canyon area, which provides essential habitat for mammals and birds. Raptors such as red-tailed hawks, Swainson’s hawks, golden eagles, turkey vultures, and prairie falcons live in the rocky cliffs and prey upon the abundance of small animals that live in this area. The area also provides habitat suitable for peregrine falcons, which have been identified for possible future reintroduction here, as well as potential habitat for the threatened Canada lynx. Other bird species, including the cliff swallow, Canada jay, mourning dove, flicker, blue jay, wild turkey, great horned owl, western screech owl, and saw whet owl, attract ornithologists and bird enthusiasts. Reptile and amphibian species include the sensitive boreal toad and northern leopard frog. 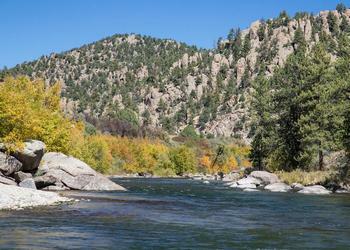 The Browns Canyon area represents one of the only riparian ecosystems along the Arkansas River that remains relatively undisturbed and contains an intact biotic community. Members of Congress, local elected officials, conservation advocates, and community members have worked for more than a decade to protect the area, which hosts world-class recreational opportunities that attract visitors from around the globe for hiking, whitewater rafting, hunting and fishing. In addition to supporting this outdoor recreation economy, the designation will protect the critical watershed and honor existing water rights and uses, such as grazing and hunting. The monument will be cooperatively managed by the Department of the Interior’s Bureau of Land Management and USDA’s National Forest Service.